I received this copy free from the author/publisher for a review. Five may sound like a high rating for a book of this kind, but for the age group, it's excellent. Plenty of writing, art, jokes, and stuff to do besides just read, kids should dig it. I think it would cater more towards boys myself, due to some of the crude humor, but girls should like it as well. 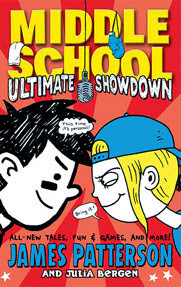 It's told through two opposing points of view - Rafe, as the stylish and gross brother who hates just about everything; the sister, Georgia, who is perky, nerdy, and loves school with a positive outlook on life. The two jibe and disagree with each other for about anything related to school, including Summer vacation, school dances, librarians, dress codes, bullies, peer pressure, extra credit, homework, and about anything else. Each side is shown with small art and told in a different style to designate who is speaking. There are a few cut outs - such as Georgias "fill in yourself" bookmark for the librarian. There's plenty of mazes, scrambled words, fill in boxes, and other arts/crafts/projects that tie in with the story going on. Besides plenty to DO, it's just cute to read and look at, with creative text and fun voices that should resonate with children. I would recommend this for high level elementary school children (fourth and fifth grade), and sixth grade middle school children. 7th grade may be pushing on how much they enjoy it depending on the books and subject the kid likes. I think they'd enjoy the text part as humorous more than the activities by that age. The first in a three-part miniseries following the terrifying adventures of the cheerleaders of Shadyside High. After head cheerleader Jennifer is thrown from a bus and paralyzed, terrible things begin to plague the other members of the cheerleading squad. Another vintage I needed to clear off my shelves. The story isn't bad for the age and it's not as predictable as a lot of his other works, but the exclamation points and false chapter cliffhangers get old. I mainly liked the characters, as simple as they seemed (which is usual), and probably should have seen the ending coming. I did know it was something to do with one girl (was right on that), but was completely wrong on how it had to do with her. Overall the story was decent but the dialogue painful. The second book in the three-part Cheerleaders series. The evil spirit that embodies Jennifer and murdered Bobbi has been laid to rest. Or has it? The murders begin again, and Corky is sure that Jennifer is behind them. So sure, she digs up Jennifer's grave to prove it. This story was ridiculously bad. Going back down memory lane and clearing some of these oldies written for kids isn't always going well. How many exclamation marks can dialogue have. !!!!!!!!!!!!!!!! 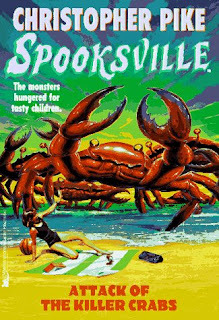 RL Stine did write some good ones, but others are positively painful. The ending was hastily tossed together without as much thought as the first one, too, even though neither were enjoyable. Not quite hideous enough for one star considering the age group it was written for. 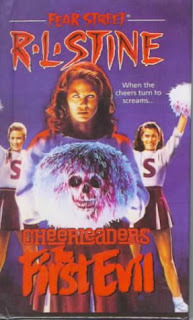 The author of the horrifying Fear Street series continues the saga of the possessed cheerleaders of Shadyside High. Corky is tormented by dreams of her dead sister Bobbi. What terrifying message is Bobbi trying to give her? When the evil begins again--more gruesome than ever--Corky knows she must learn the secret that will destroy the spirit's power for good--or be the next to die. A lot better than the other two surprisingly. This one didn't jump around as much because they were kind of all together in a camp and then home. There were also no annoying cliffhanger chapters and toned down on the !!! dialogue a bit. Since it was wrapping it up with a backstory the plot was a bit more solid/interesting as well. Discovering huge blocks of ice inside the woods of Spooksville, Adam and his friend inadvertently set free the Cold People, who soon after ravage the town, freezing everybody they touch. Another really cute Spooksville story that shows that, no matter the age it's written for, Pike is a talented author. The backstory was inventive and science-fiction rich when told by Bum. The dialogue was humorous as always, each kid having their typical differing personalities. The end was charged with suspense for this age-group, inventively defeating the monsters without silly coincidence that randomly springs up. Spooksville is in trouble. Huge crabs have appeared on the beach. The crabs keep coming, and it seems no weapon can stop them. These were written way back when for grade school children, but even so, Pike injects humor, interesting stories, and different character personalities. He doesn't rely on weak dialogue and mixes a bit of science fiction into the stories. Kids would really love these, as they should, as the stories hold originality and make you chuckle every once in awhile, especially with the selfish Sally and the deviously greedy 'Bum'.